Protect your portfolios more effectively, raise more assets, test trade ideas and automate your daily risk tasks, all in a single platform. Grow your business, organize client information, comply with regulators and prepare recommendations in a fully automated fashion. Automate workflows to help you grow your business, integrate liquid and illiquid investments and streamline your family reporting. "Everysk Technologies provides asset managers with access to a sophisticated tool that ultimately drives value in times of volatility and uncertain markets". "We leverage Everysk's API to automate the various tasks a risk team would perform daily, ranging from granular analytics to storing and tagging portfolios and reports in our secure Dashboard account". "I cannot say enough positive things about Everysk as they exceeded our expectations. Their risk software is eye catching, useful and very affordable for emerging managers. Most importantly, their customer service is of the highest level I have seen". 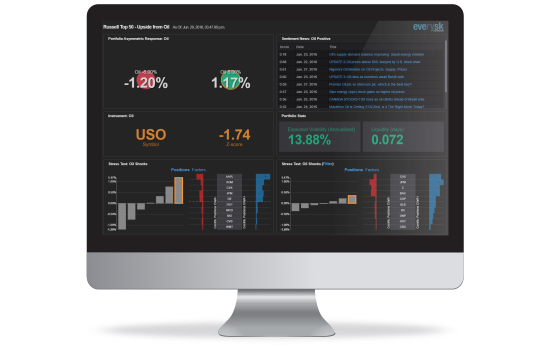 "Everysk Reports gives us unprecedented granularity and speed to stress test our L&S positions, providing the portfolio manager with prompt information for risk assessment and formulation of short and long-term strategies". We are the leading provider of risk workflows, enabling professional money managers with an automation platform that is fully integrated with our powerful forward-looking risk engine. 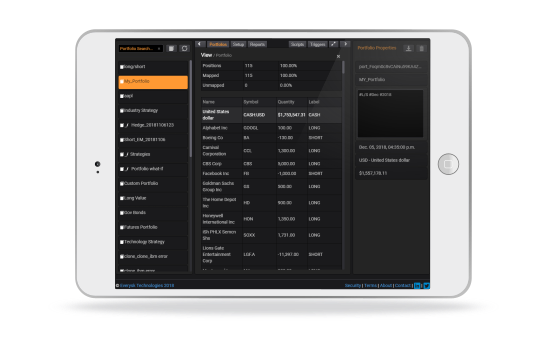 Our workflows will analyze, organize and securely distribute information about your investments, saving you valuable time. More precision to protect your investments: Powerful calculation engine designed to analyze portfolios ranging from simple equities to more complex multi-asset, long/short portfolios. Thousands of forward-looking portfolio outcomes are simulated in seconds. Every security is fully repriced to reflect their nonlinear behavior, when applicable. Calculations are transitive and reliably capture how risks propagate across each security in times of market stress. Benefit from Everysk's fully integrated calculation engine. Perform stress testing, risk attribution and factor modeling using modern statistical methods to forecast securities behavior in the near future. Risks are transitive and tend to propagate across asset classes. Capture possible contagion in a robust manner. Thousands of possible portfolio simulations are processed by our servers in seconds. Securities are fully repriced, preserving their non-linearities when applicable. Ready-to-use templates covering all aspects of portfolio risk, such as: stress testing, risk attribution, factor modeling, exposure analysis and pro-forma backtesting. Easily perform what-if analysis using comparative templates. Side-by-side visualizations illustrate the effect of trades and different market conditions. Create your own customized templates from dozens of available visual and tabular widgets. Alerts operate as specialized risk managers working 24/7. User defined thresholds are easy to setup and a warning is automatically emailed to custom recipients when certain conditions are met. Several sample alerts are included, covering: diversification, liquidity, factors, exposures and currency risks. Endless possibilities to clone/customize your own alerts using Everysk's scripting language and calculation engine. Tailor your alerts to help with your regulatory compliance requirements. Most risk and portfolio tasks are repetitive and labor intensive: importing positions from brokers, mapping and normalizing positions, storing spreadsheets, generating graphs and reports and distributing them can become a real burden on your day. Increase your firm's productivity by fully automating these daily tasks into customizable workflows. Analyze, organize, tag and distribute portfolio risk information in minutes rather than hours. Orchestrate custom alerts and reports. 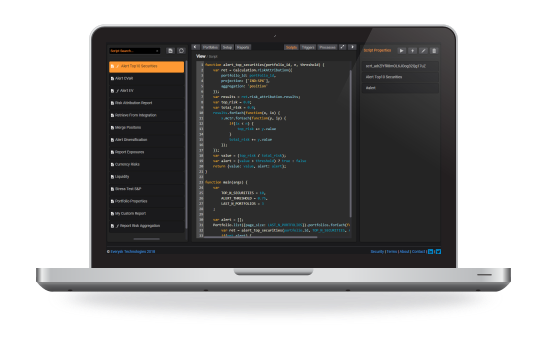 Benefit from a powerful scripting language that specifies the logic behind a workflow. Establish a repeatable and robust risk process and design additional ones as your business grows. Run several specialized workflows, tailored for: sales, risk, portfolio management, trade analysis and regulatory purposes. Flexible integrations, supporting secure FTP transfers, secure email attachments and third party APIs. When position files are pushed to our secure servers, specific actions can be automatically triggered. Define your own rules to merge positions and net asset value from multiple sources. Quickly link any script with one or more triggers. Triggers are uniquely identified in the platform and can be hashtagged for efficient retrieval. A single trigger can invoke multiple script executions in parallel for complex workflows. Triggers can be associated with a specific time, event or API call. Historical portfolio snapshots and reports contain valuable information and should be tagged and stored for easy retrieval. Historical portfolios are critical to help detect undesirable properties early-on. Historical reports are required for improved client communications and regulatory compliance. Automated workflows will tag, annotate, store and create powerful namespaces to organize all your information. Every entity that is created in the platform will have an unique identifier for inclusion in your workflows. Always have the relevant information at your fingertips. Filter by hashtags, dates and unique IDs to quickly isolate only relevant information. Every object is searchable. Easily inspect each object by clicking on its unique ID. Unique IDs are links to their source description and enable efficient navigation. Perform data filtering using chained hashtags to refine your search, retrieving several portfolios/reports or single ones. Make your account multiply itself by organizing information in namespaces. Only portfolios, templates, reports, scripts, triggers that are relevant to the namespace will be shown. Namespaces can be any entity related to your business, such as: clients, advisors and model portfolios. Maintain separate lists of recipients for your reports and alerts, such as: clients, investment committee and risk group. Reports can be delivered as encrypted links in emails. For security reasons, links have a set expiration time ranging from an hour to 30 days. Use the platform to orchestrate all the risk deliverables from your business. Your clients will receive emails with your logo and disclaimers. Benefit from a flexible REST API. Customize your ideal workflow in the language of your choice, performing calculations and controlling the platform. Bottom-up and top-down granular risk attribution, factor modeling and stress testing using modern math finance. API includes calculations and data: no need to purchase separate data licenses. Portfolios are always stored and transferred utilizing industry standard encryption. Your portfolio information is never exposed. Built using the most reliable and secure provider of servers, network and data centers on the web. Enable an individual security key for strong 2-step verification using the FIDO Alliance U2F protocol.